Sinusitis is an infection of the sinuses near the nose. Sinusitis usually occurs after a cold or allergic inflammation. Sphenoid sinus: located deep in the face, behind the nose. This sinus does not fully develop until adolescence. What are the three types of sinusitis? Chronic sinusitis: occurs with repeated acute infections or with previous infections that were inadequately treated. The symptoms last longer than three months. 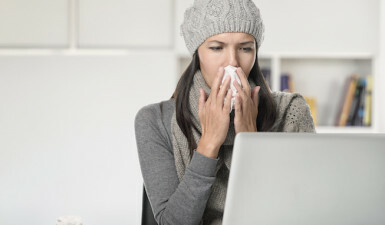 A sinus infection often happens after an upper respiratory infection (URI) or common cold. The URI causes inflammation of the nasal passages that can block the opening of the paranasal sinuses and result in a sinus infection. Allergies can also lead to sinusitis because of the swelling of the nasal tissue and increased production of mucus. Always consult your child’s physician for a diagnosis because the symptoms of sinusitis may resemble other conditions or medical problems. How do you diagnose sinusitis? Endoscopic sinus surgery is used to open the passages of the sinuses and allow proper drainage to the nose. During the surgery, an otolaryngologist uses an endoscope (a small tube with a light and camera lens at the end) to view the inside of the nose. The otolaryngologist makes small incisions (cuts) to allow the scope to pass. These cuts are usually made inside the nose. During endoscopic surgery, the otolaryngologist may create new passages or open and enlarge existing ones by removing polyps, cysts, or thickened mucus membranes. Endoscopic sinus surgery usually takes between one and three hours and is done in the operating room with the child under general anesthesia. Some young children spend the night in the hospital, but most older children may stay for only a couple of hours after surgery. Depending on the otolaryngologist’s preference and the needs of the child, endoscopic sinus surgery may be performed at the same time as another operation such as septoplasty, tonsillectomy, adenoidectomy, or insertion of ear tubes. What happens after endoscopic sinus surgery? Your child will have intravenous (IV) fluids until the time of discharge. Clear liquids are available for your child in the post-anesthesia care unit (recovery room). Your child may complain of a sore nose, not being able to breathe through the nose, and difficulty swallowing. A pain reliever may be given for pain. An antibiotic is occasionally prescribed to prevent infection. The head of the bed will be raised in the post-anesthesia care unit to help with swelling, breathing, and drainage. At home, you should have pillows or a recliner chair available to help your child stay comfortable with the head elevated above the level of the chest. There may be packing in the nose to prevent bleeding. Sometimes, this packing is dissolvable. The physician may remove this packing in one or two weeks, or it may dissolve on its own. If the packing needs to be removed, it may be done in the physician’s office for older, cooperative children, or may be done in the operating room under anesthesia. If a septoplasty (straightening of the bone and cartilage in the center of the nose) is performed, splints may be placed inside the nose at the end of the operation. These will be removed at the physician’s office in one to two weeks and may cause some discomfort while they are in place. If packing is used, your child may be able to feel it in the nose. Your child should be told before surgery that she or he may feel like there is something in the nose when waking up. If packing is not used, swelling may cause this feeling. Your child should know not to forcefully blow the nose for a week or two. At first, there may be some drainage from the nose. You may see a small piece of gauze taped under your child’s nose. This is called a “drip pad.” This is usually only needed for the first day, if at all. The drainage from the nose will probably be tinged with blood. Your child may cough or spit up some pink or brown mucus. Most children are fussy the first few hours after this procedure. Your child may begin normal play after several days but may need to stay home from school until the discomfort improves. Consult your child’s physician for more specific recommendations. Your child’s physician may recommend the use of nasal ointment, salt water spray, or nasal steroid spray after surgery. Follow instructions carefully. What follow-up is needed after endoscopic sinus surgery? Your child will be scheduled for a visit with the otolaryngologist about one to two weeks and then again several more times in the months after surgery to make sure the nose is healing properly. Call your child’s physician if you have any questions. What is the Image Guidance Surgery? An exciting new advance in sinus surgery is now being to perform intricate sinus surgery. Image Guidance CT navigated tracking system allows otolaryngologists to perform difficult sinus surgeries with minimal invasiveness. Specialized CT imaging visualizes the internal sinus structures and monitors the positioning of surgical instruments within these structures. Â Image Guidance CT navigated tracking systems allow surgeons to perform the procedures safer with minimal blood loss.